Tents is a logic puzzle. - There are exactly as many tents as trees. - The tents and trees can be matched up in such a way that each tent is directly adjacent (horizontally or vertically, but not diagonally) to its own tree. However, a tent may be adjacent to other trees as well as its own. - No two tents are adjacent horizontally, vertically or diagonally. 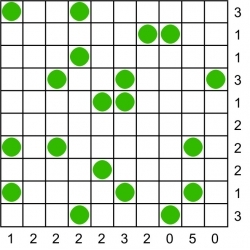 - The number of tents in each row, and in each column, matches the numbers given round the sides of the grid.